We 100% guarantee your satisfaction in the quality of our product, or Your Money Back! ghosting, smudges, incorrect perforations, form alignment, incorrect folding, incorrect size, incorrect paper weight, incorrect finish, and incorrect paper stock. The customer’s choices on the graphic design, paper specifications, folding options, finish and paper weight must be decided prior to printing. These are considered matters of taste and personal preference. 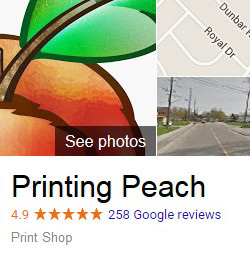 They are not in any way covered by the guarantee unless Printing Peach prints with specifications contrary to those specified by the customer. While we do try to catch errors in customer supplied files, this is not our responsibility. It is normal that the cutting process as well as folding processes may be off to a maximum of 1 mm. This is industry wide and not specific to Printing Peach. This is the reason that bleed and text safety are included in the print files. Bleed and text saftey in essence, allow the cutting and folding processes, to a small degree, to fail very gracefully. Printing Peach does not guarantee against issues based on files that have not been properly prepared by the client to anticipate these limitations. There are a number of very good reasons why we cannot guarantee 100% colour accuracy. We recommend you read more about this potential issue and how you can best ensure your satisfaction here. Our money back guarantee covers the full cost of the print product, but does not cover the cost of shipping. Items being refunded must be shipped back to Printing Peach prior to the purchase price being refunded or the product being reprinted. Printing Peach cannot guarantee turnaround time or shipping time as our suppliers and shippers do not guarantee these things. This is simply out of our control. All of our suppliers do their best to ship out products when they say they will and do a very good job. However, there can sometimes be delays. If getting your print materials 1 or 2 days later than the typical delivery time would be a major problem, we kindly suggest that you use a local printer for this job and take advantage of our great prices and quality on your next job. Our web design guarantee is very simple: If through the revision process were not able to create your website to your satisfaction, we will refund any deposit or payments made up until that point. The only exception would be if we had supplied a copy of the code/work to the client already. At this point we have no way to guarantee the client will not use the work. This would be an unusual situation in that code is generally kept (although not owned) by Printing Peach. Our graphic design guarantee is very simple: If through the revision process were not able to create your website to your satisfaction, we will refund any deposit or payments made up until that point. The only exception would be if we had, at the client’s request supplied a high resolution/print ready copy of the files. In this case, the client has essentially already received the goods with no way for us to be sure they will not be used.